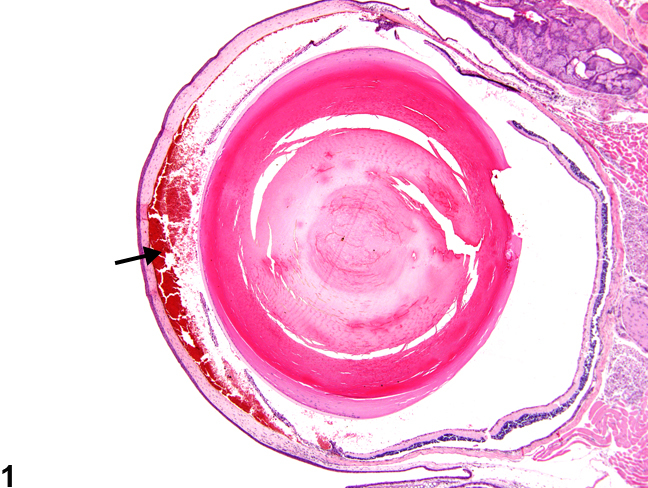 Eye, Anterior chamber - Hemorrhage in a female Swiss Webster mouse from a chronic study. Hemorrhage (arrow) consists of large numbers of extravasated blood cells in the anterior chamber. 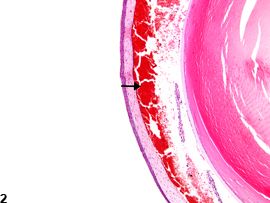 Eye, Anterior chamber - Hemorrhage in a female Swiss Webster mouse from a chronic study (higher magnification of Figure 1). 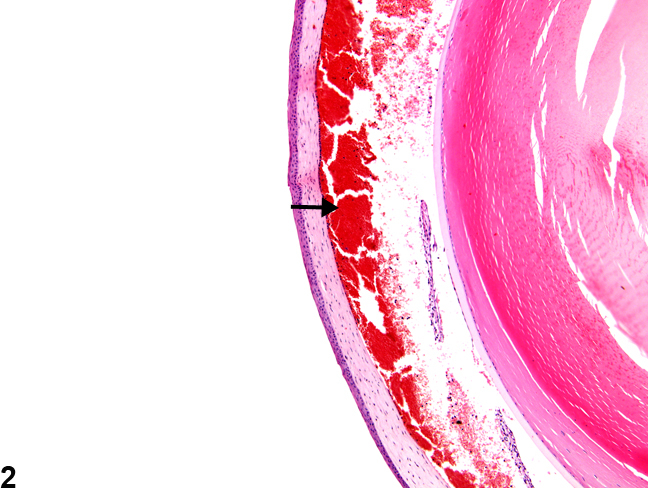 There are large numbers of extravasated blood cells (arrow) in the anterior chamber. Hemorrhage in the anterior chamber is characterized by extravasated blood cells in the space between the cornea and iris ( Figure 1 and Figure 2 ). Clinically, this is referred to as hyphema. In laboratory rats and mice, anterior chamber hemorrhage is not uncommon as a sequela to trauma from retrobulbar bleeding procedures. It can also result from acquired damage to iridial or ciliary blood vessels (as from inflammation or metabolic disease) or from leakage from persistent embryonic vessels around the lens or iris. Rats with sialodacryoadenitis virus infection can also exhibit anterior chamber hemorrhage, among other ocular lesions. Extravasated blood cells in the anterior chamber can occlude the iridocorneal filtration angle channels and/or the adjacent trabecular meshwork, impeding normal drainage of aqueous humor with resultant elevations in intraocular pressure. Anterior chamber hemorrhage should be diagnosed and assigned a severity grade. If anterior chamber hemorrhage is part of a more dispersed inflammatory process in the eye, it need not be diagnosed separately unless warranted by its severity. Kakehashi A, Saito Y, Mori K, Sugi N, Ono R, Yamagami H, Shinohara M, Tamemoto H, Ishikawa SE, Kawakami M, Kanazawa Y. 2006. Characteristics of diabetic retinopathy in SDT rats. Diabetes Metab Res Rev 22:455-461. National Toxicology Program. 1993. NTP TR-417. Toxicology and Carcinogenesis Studies of p-Nitrophenol (CAS No. 100-02-7) in Swiss Webster Mice (Dermal Studies). NTP, Research Triangle Park, NC. Shinohara M, Masuyama T, Shoda T, Takahashi T, Katsuda Y, Komeda K, Kuroki M, Kakehashi A, Kanazawa Y. 2000. A new spontaneously diabetic non-obese Torii rat strain with severe ocular complications. Int J Exp Diabetes Res 1:89-100. Smith RS, Sundberg JP, John SWM. 2002. The anterior segment. In: Systematic Evaluation of the Mouse Eye: Anatomy, Pathology, and Biomethods (Smith RS, John SWM, Nishina PM, Sundberg JP, eds). CRC Press, Boca Raton, FL, 111-159. Williams DL. 2005. 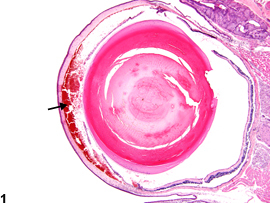 Ocular disease in rats: A review. Vet Ophthalmol 5:183-191.